DALLAS – Military shoppers can find a winter wonderland of savings at the Army & Air Force Exchange Service simply by shopping Dec. 21 and 22. When shoppers make a purchase those two days, they will receive a coupon to save 10 percent off from Dec. 26 through Jan. 5, with a maximum discount of $200. The coupon is available at the registers while quantities last. The coupon is valid in-store or at shopmyexchange.com. 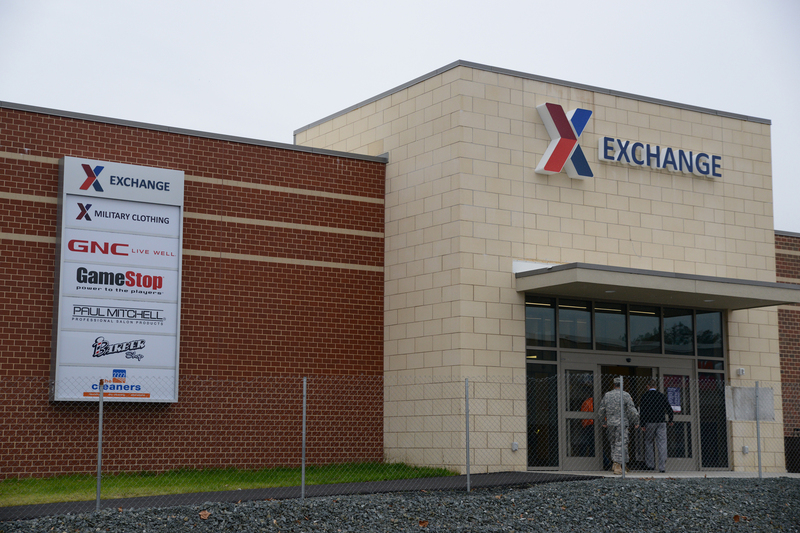 FORT MEADE – The brand-new Fort Meade Exchange has opened its doors, bringing a modern shopping experience to the community just in time for the holiday gift-giving season. The $37.2 million Exchange welcomed shoppers for the first time Nov. 25. The new main store has been under construction since 2012 and replaces a 40-year-old facility. At the 166,869-square-foot-store, Soldiers, retirees and their families will find special concept shops for top brands, including Michael Kors, Ralph Lauren, The North Face, Columbia and Victoria’s Secret. The new store will also sell major appliances and furniture, including Ashley. A special Operation: Be Fit section has been added as well. Military Clothing, previously housed in a separate building that was built in 1953, has been relocated inside the Main Exchange. In the mall, military shoppers will find new businesses, including a tactical shop, floral shop, Paul Mitchell salon and Pro Image Sports, which sells jerseys, caps and other memorabilia. As another convenience to military shoppers, Fort Meade’s pharmacy has also moved inside the mall. The new food court is serving up something for everyone. Denny’s Fresh Express and Boston Market represent each of those chain’s second locations on military installations. Domino’s, Starbucks, Charley’s and Subway round out the offerings. Regular hours of operation are Monday through Saturday from 9 a.m. to 9 p.m. and Sunday from 10 a.m. to 6 p.m. A grand opening ribbon-cutting ceremony will be planned in 2015. DALLAS – With the busy, and expensive, holiday shopping season upon us, Army & Air Force Exchange Service gas stations worldwide are helping to make sure that filling up doesn’t empty the wallet. From Dec. 19 to Dec. 21, the MILITARY STAR® card is doubling the everyday 5-cents-per-gallon gas discount cardholders receive when fueling up at an Exchange gas station. On those three days, drivers paying for gas with their MILITARY STAR® card will receive 10 cents off per gallon. DALLAS – The Exchange’s already stuffed awards case got another one: the Subway Award for Business Excellence. The Exchange is the flagship recipient of the award from the corporation, presented to managers at a national convention in San Diego, Calif. The Exchange qualified for the Subway Award for Business Excellence after ranking in the top 10 in six categories for restaurant development, customer satisfaction, financial strength and other areas. In addition, the Exchange ranked in the top 10 for multi-unit owner franchisee of the year in the Asia, Europe and USA West Plains areas. The Exchange operates 207 Subway restaurants around the world and has opened 16 Subways in 2014, including one in the Eastern European country of Kosovo. 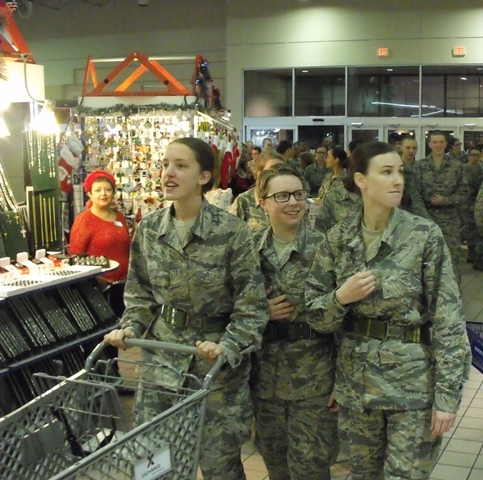 JOINT BASE SAN ANTONIO-LACKLAND – Holiday spirit filled the air at Joint Base San Antonio- Lackland’s Exchange as 2,000 Air Force Basic Military Training recruits were treated to a special shopping event Dec. 6. The Exchange opened extra early at 6 a.m., allowing busloads of recruits, who will spend their holidays in basic training, to shop for gifts for their family and friends without interrupting their busy training schedule. A DJ, dance and trivia contests as well as giveaways kept the mood merry and bright. Recruits picked up free items from YourSoles Insoles, M&M Mars, Coca-Cola, Jack Black Cosmetics, Hershey’s and other vendors. After shopping, recruits rode buses back to JBSA’s Basic Military Training reception center, where volunteers helped wrap their gifts. Recruits were then taken to the Exchange’s The UPS Store to have gifts shipped back home. “Basic training is stressful, and this event has been a nice experience,” said Dominick Newland from Hockamo, Ind. Lackland Exchange Store Manager John Burk called the event a success. DALLAS – As Soldiers, Airmen and their families tackle their holiday shopping, the Army & Air Force Exchange Service is offering special deals every Saturday until Christmas, with up to 50 percent off select items. Deals on Dec. 13 include 50 percent off assorted accent furniture, 30 percent off a DeWalt 156-piece mechanics tool set and 25 percent off Skullcandy gaming headsets. On Dec. 20, shoppers save 30 percent on a Lifetrak Zone activity watch and 25 percent on a Canon PowerShot digital camera bundle with SD card and case. “From deals on Russell Stover chocolates and Yankee candles to holiday home décor, military shoppers are sure to find something special for everyone on their lists,” said Air Force Chief Master Sgt. Sean Applegate, Exchange senior enlisted advisor. To view the specials, shoppers can visit www.shopmyexchange.com/savings-center/weekly-ads.